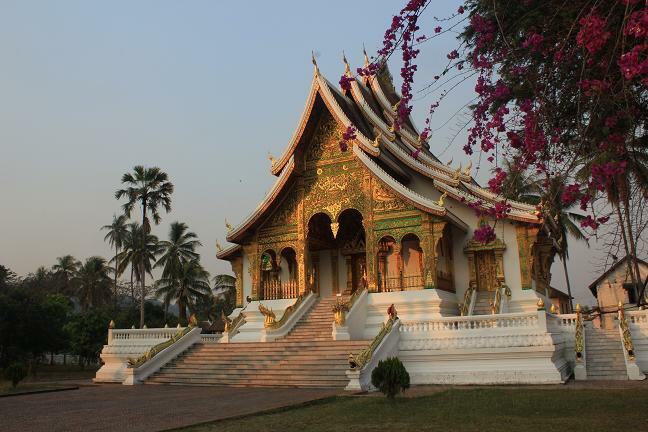 Luang Prabang is famous in Laos for its beautiful architecture and picturesque location. Unfortunately, I didn’t get to see any of this, as I arrived – tired and frustrated – at three in the morning. No guesthouses were open at this point (can’t blame them), so the two English travelers I met on the ride over and I trudged down the street in a vein attempt to find or own manger to stay in. We failed. We resigned ourselves to spending the rest of the mroning on the streets. Luckily, Luang Preabng has a curious early-morning tradition that was to keep us occupied in these wee hours. 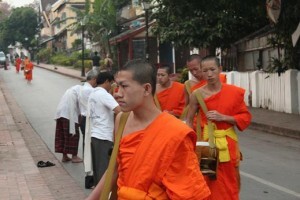 From 5:30 – 6:30 every day, the local monestaries extrude long lines of orange clad monks, who march the streets carrying a silbved bucket, into which devoted local Buddhists and voyeuristic tourists put wads of sticky rice, bananas and biscuits, to feed them for the day. The monks aren’t allowed to buy food themselves, they must rely on this tradition. So, with a basket of rice in hand, i sat down on the side of the road, and began feeding the monks (since there was no sign around telling me that I couldn’t). At around 6, a nearby guesthouse finally opened, onto whose owner I pounced (not literally) for the first available room. 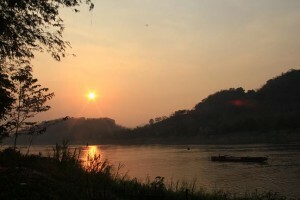 I had arranged a night road trip to Luang, as I thought it would give me more time in the next day to explore. But this plan never works. You;re always exhausted, and always spend half a day at least recovering from the ordeals. Which is what I did. Midday I woke. After showering and changing, I headed for the large, forested hill in the middle of the city. On top is situated a large temple, accompanied by fantastic panaromic views of the confluencing rivers that encircle the area. 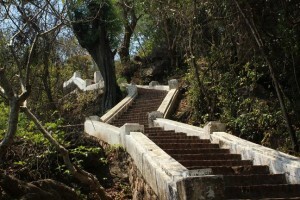 It was a steep, sweaty climb (my shower 15 minutes previous compeltely redundant), but it was certainly worth the effort. Climbing down the other side, I ended up on the banks of the smaller Nam Khan river. Along its banks were dozens of restaurants, at which I rested and ate, while watching teenage monks shed their outer robes to play in the river’s milky waters. I hadn’t expected to see this. I thought Buddhism was a solemn life of scholarly reflection. Then again, neither had I expected to hand feed a monk a ball of rice. I certainly was learning a lot about Buddhism. 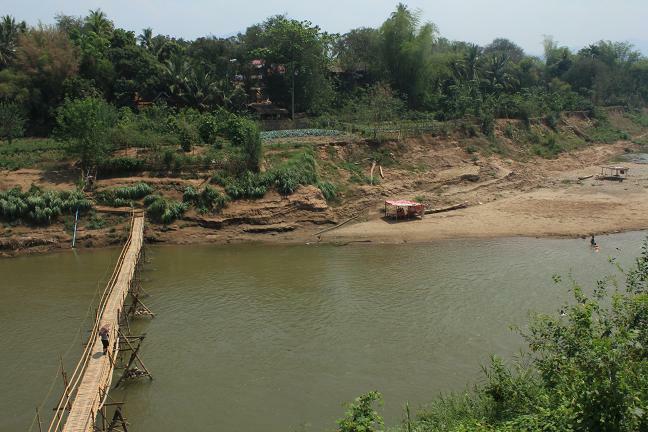 After lunch, I walked across the second ricketiest bridge in the world (the first beign in Vang Vieng). It cost a few pence – paid to the family who built it – as I was told there was an itneresting village to see on the other side. There wasn’t – just a small shop with several bemused tourists outside. Not wanting to be one of them I walked back, where I met 3 young monks collecting tamarind pods from the leaf litter. Seeing me walking back and forth, they took pity on me, throwing my some of the delicious seeds and had a brief chat about Buddhism. I think there’s somethign in this karma thing. A few hours ago I was feeding some of them, now they in turn were feeding me. In the evening, I wondered the night market, occaisonaly bumping into my two English friends. The market had lots of interesting stuff on offer, but having been to so many markets in the past few weeks, I wasn’t really paying attention. What I did take in, though, was the food stalls. The food I had, while delicious, was pretty anonymous. The filling in my spring rolls could have been animal, vegetable or mineral. I;m still not sure. I arranged to meet a tuk tuk driver the next morning who would take me to Kuang Si Waterfalls, a trip I shall tell you about soon.